As I prepare to embrace a new year and a new decade, I decided what better way to start anew than to experience some mathematics. The timing, therefore, was perfect as I received notice of the first installment of the UCLA Science Faculty Research Colloquium Series featuring long time UCLA mathematics professor Thomas M. Liggett who is also a member of the National Academy of Sciences. Professor Liggett’s topic for the hour long lecture was “Stochastic Models for Large Interacting Systems in the Sciences,” which is a tremendously successful area of research in probability theory that has broad real life applications including cancer research and traffic flow. The supersized lecture hall in the Physics and Astronomy Building was filled with undergrads, graduate students, postdocs, professors, and mathematics alumni like yours truly. Even Field Medalist Terry Tao showed up. 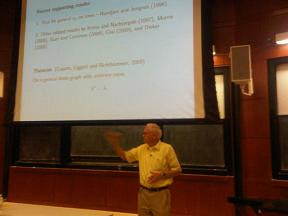 I grabbed a choice seat front and center and was thoroughly entertained as Dr. Liggett orchestrated the proceedings. It was a fascinating way to spend an evening. After the lecture it was time for the reception and I got to meet a few people I hadn’t seen since the past fall quarter. First, I chatted with the new chair of the math department, Sorin Popa who takes the reins of the department whose graduate program is now ranked 3rd nationally. He described the new recruiting efforts underway to attract top-tier first year undergraduates for full academic scholarships, a strategy to be more competitive in the Putnam mathematics competition. The department is in great shape overall, however the budget crisis in California is adversely affecting all UC campuses. I also got to speak to department communications coordinator Lisa Mohan who is in charge of the excellent department newsletter that apparently has great reach. I recently had dinner with an old UCLA college buddy who is also a mathematics alumnus and he brought a copy of the newsletter to tell me my picture was in it. How’s that for fame – math fame – got to love it!